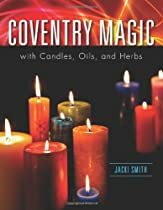 I’ve been reading a new book called COVENTRY MAGIC by Jacki Smith. It’s an awesome book on Candles, Oils, and Herbs with a powerful punch of self reflection and self help at the beginning. there are also candles available on her online store COVENTRY CANDLES. These are ready to go and easy to use. Candles are pretty, add a great atmosphere to your room, but are also perfect for your moon rituals and alter work. I like to start out simple with my little rituals and add on as I get more familiar and comfortable with what I am doing. Using candles in your moon rituals add that extra oomph to your manifestations. Try it and keep it simple at first. Always remember to close your circle after you are done! Have fun!! Your candle doesn’t have to be any specific size, it doesn’t have to be expensive or made of any special material. Your intention & personal power you ‘charge’ the candle with is what’s most important (see ‘Charging A Candle’ from the first Candle Magic page). Using a candle color that corresponds to the energy or spell you are trying to invoke assists the spell-maker to accurately program personal power (see ‘Candle Colors’ from the first Candle Magic page), so if you can, purchase an appropriate color. Carve symbols on the candle that are appropriate for the spell. For example, a heart for love, a dollar sign for a money ritual, the initials or name of the of the country or state you want to move to, a crescent moon for sleep or psychic awareness. Rune symbols are also good for carving into candles. I use a seam ripper to carve my candles as it has a small tip and is easy to manage. ‘All Purpose White’. If you can’t find an appropriate colored candle, using a white candle can be used for every positive magical purpose. Size Doesn’t Matter. I use tea candles for candle magic! I also use the ‘standard’ votive candle as they are easy to contain, come in many colors, and are safely burned for long periods of time. Anything found from the Earth – leafs, stones, flowers, feathers, shells, etc. A person can be represented by a candle representing their sunsign, or if you are doing a spell for someone you can represent that person with a candle representing their sunsign.